Organiser: The contest is hosted by The LNM Institute of Information and Technology, Jaipur. 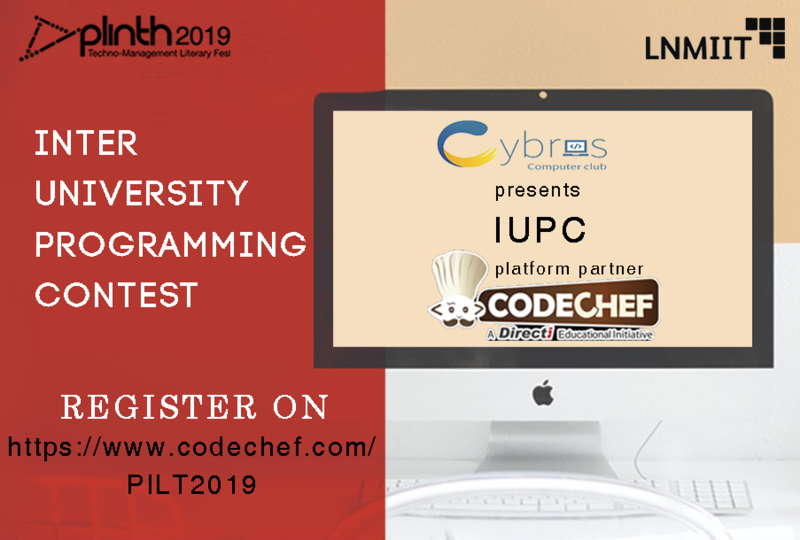 This contest is an online qualifier for IUPC onsite round to be held on 19th January 2019 in the college itself. Prizes: 250 laddus to each member of the top 3 teams. Cut off score for the onsite round would be declared after the contest. For prizes and to be eligible to take part in onsite round please register yourself here. -IN IUPC123 the tree is rooted at 1. -The test cases for DIFFSTR have been updated. Sorry for the inconvenience caused. All previous solutions are being rejudged. -In ZETAJ Position of the bomb in a particular section does not matter, just the count matters. -In MONICA12 print the answer Modulo (10^9)+7 -Problem statement for ZETAJ has been updated, please refresh your page _ 01:10 : Solutions of ISLNDTFE would be rejudged soon, TC have been Updated for the problem, Sorry for the inconvenience _ 01:16 : Solutions of ISLNDTFE have been rejudged.